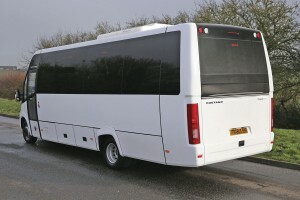 In the days before Salvador Caetano’s UK operations were centred on contracts with National Express, it was a significant player in the small coach market. Successive generations of the Toyota Coaster based Optimo were offered for three decades from 1985 but there were also other options including a number of Fiat or Iveco products tracing their origins back to the 60-10 based Beja, sold under the Moseley Continental brand. Contemporary with the original Optimo was the Viana on the Iveco 79.14 which served in fleets such as Premier Albanian of Watford and Wallace Arnold who took a pair. Later there was a scaled down version of the Algarve on the rear-engined Iveco 315 midi chassis, sales of which just failed to reach double figures. Despite these alternatives, it was the Optimo that was the major seller and they were and are to be seen throughout the country as well as elsewhere in Europe. It looked attractive and the interior was comfortable. Originally configured in a 2+1 seating layout exclusively, there were later models that offered a wider body with 2+2 seating for a maximum of 26. When non air conditioned, steel sprung coaches with manual gearboxes were the norm, it was the ideal coach to run alongside bigger coaches but as they developed and disc brakes, air suspension, and automatic transmission, at least as an option, became the standard, it was increasingly left behind. In its early years, there were some quite significant fleets, especially among car hire firms such as Avis at Heathrow, but the last significant Optimo order was the ten supplied to Mayday Travel of London in 2008. The last version of the Optimo to be offered in the UK was the CS700 which featured the frontal styling and curved rear of the Winner/Levante models. It came to the UK in 2012 and on 26 October of that year, B&CB issue 1197 carried our evaluation of the coach. Equipped with the Euro5 Toyota 15BFTE four-litre 150bhp engine and five-speed Toyota manual transmission, it was 7.72m long and 2.194m wide and offered 22 seats in a 2+2 layout. Unfortunately, it was destined only to achieve ten sales, one of them to Cyprus. Although Toyota continues to build the Coaster chassis for certain non-European markets, a decision was taken that it would not be developed to satisfy Euro6 and this would have spelled the end for the model had Caetano wanted to continue with it. With the demise of the Mercedes-Benz Vario creating a void in the market in the 27-33 seat sector that it had previously dominated, Caetano was already working on a new small coach option based on the biggest variant of the Iveco Daily, the 70C17, which has a maximum GVW capacity of 7.2tonnes. 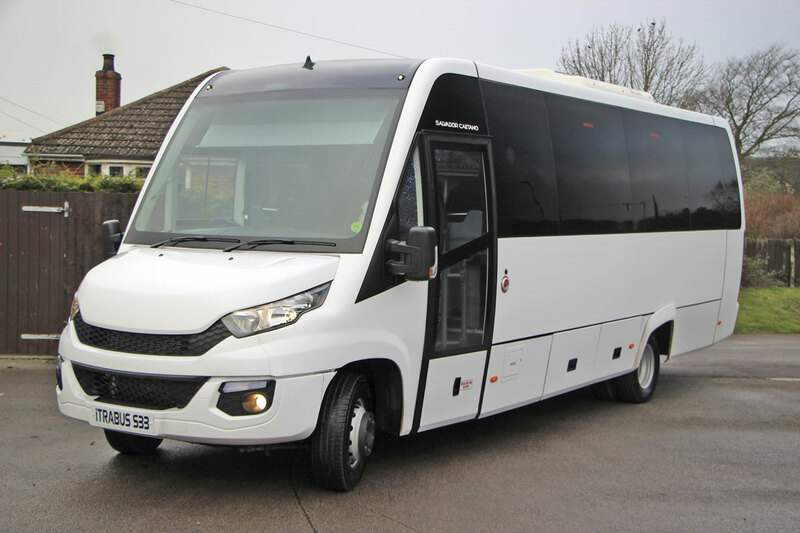 Last week I visited Salvador Caetano UK’s premises at Heather near Ibstock in Leicestershire to meet up with Retail Sales Manager, John Dunn, who showed me the new coach, told me all about it and accompanied me on an evaluation run. For most of its production span the Optimo had been built at a plant in Ovar where the company also built Toyota light trucks and vans, but latterly production had been moved to the main plant in Vila Nova de Gaia where the full sized Algarve, Enigma and Levante models were and are built, as well as the City Gold bus bodies seen on the MAN CNG fuelled buses for Arriva and Anglian. A separate production centre on the same site is also where the Cobus 3000 airside bus, near ubiquitous at Europe’s airports, is assembled using front and rear assemblies built at Daimler’s Samano plant in Northern Spain. 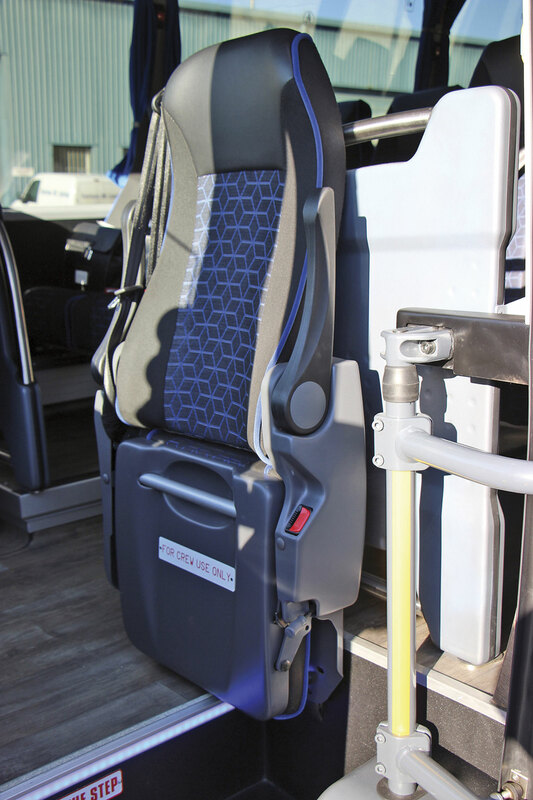 It is at Gaia that the new model, christened the iTrabus, is being built, though some minor items such as wheel embellishers, curtains, first aid kits and fire extinguishers are being fitted following arrival in the UK. Mounted on the latest Daily chassis cowl and retaining the front bonnet assembly from it, including the grille and bonnet panels, the coach is constructed using welded steel framing. GRP is used for the rear panelling, the rear boot flap, the front and rear domes and the wheelarch coves and moulds, with the roof constructed of GRP sides and a Pecolit centre section. Waist panels are 1mm thick steel sheet and the skirt panels below the waistrail are in 3mm aluminium sheet. 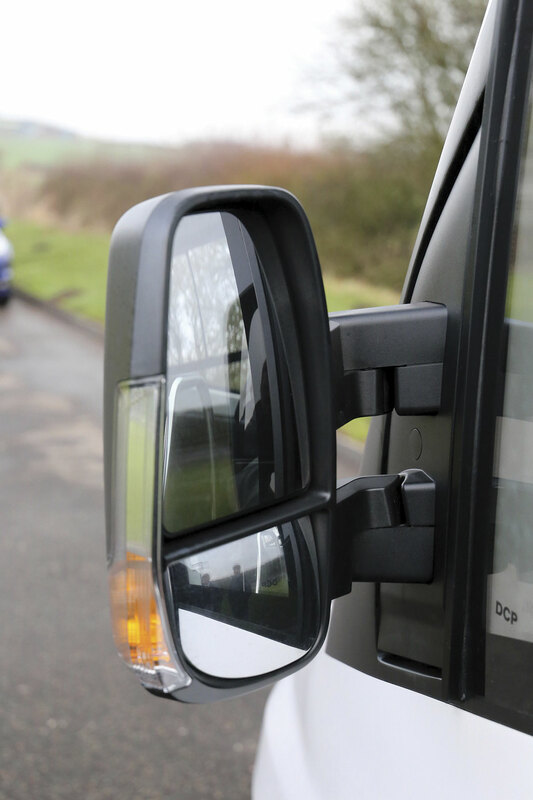 The front one-piece laminated windscreen is bonded in place as are the double-tinted, double-glazed curved side glasses and the large tinted single glazed rear window. 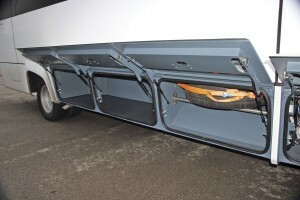 The wide emergency door is at the offside rear and has a single drop down step with checkerplate surface. I know they are a legal requirement but I just don’t get what the point of these steps is; they would be no use whatsoever to the overwhelming majority of passengers trying to get out of the vehicle quickly in an emergency and could very easily slow everyone down. Shutting the door once it has been opened has a knack to it that involves closing it to around 45-degrees before you re-deploy the step. There is no separate driver’s door at the front. It is noticeably wider than the Optimo CS700 at 2,475mm which enables full sized Vogel Eco10 Deluxe recliners to be used. 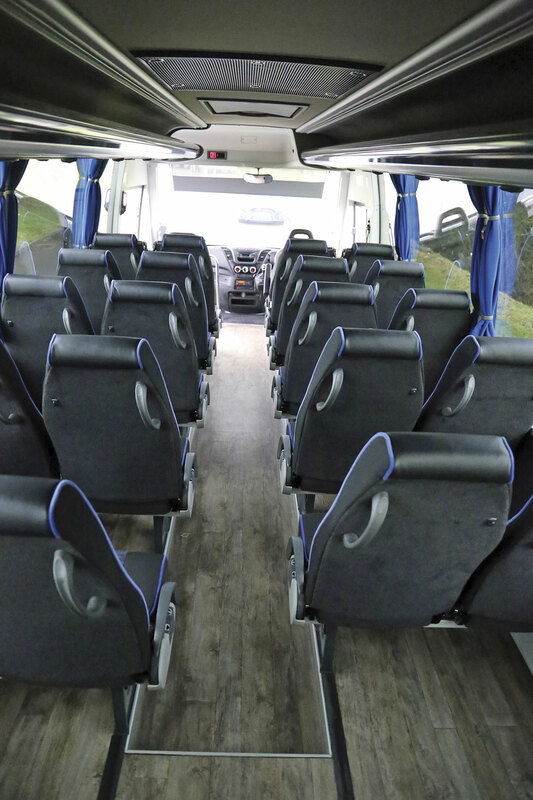 UK versions will offer a maximum of 29 seats though there are minimally specified versions without luggage compartments offered for school transport in some European markets that can accommodate up to 31 passengers. At the rear there is a relatively large boot with access via a one piece flap supported on each side by gas struts. With 29 seats, there is not a huge amount of leeway for luggage to be carried, the signage says 70kg, but there is nevertheless a useful 2.27 cubic metres available, with additional side lockers on both sides providing more space, though no doubt that on the offside would be given over to the driver’s cleaning equipment in many cases. 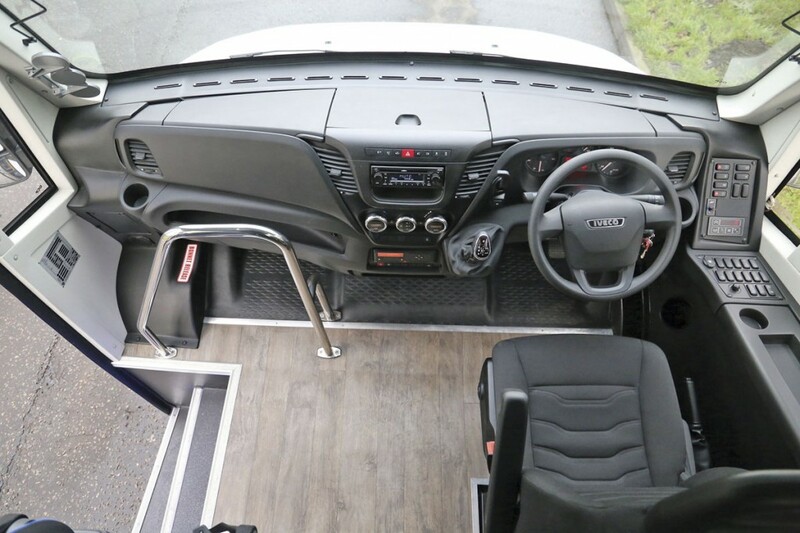 If you want to be fully legal you are going to have to be careful how you utilise the coach, as you are with any coachbuilt Daily, because the maximum GVW is only 7.2 tonnes, with 2,500kg and 5,350kg limits on the front and rear axles respectively. On both sides, the locker provision is quite long, each covered by two lockers flaps. 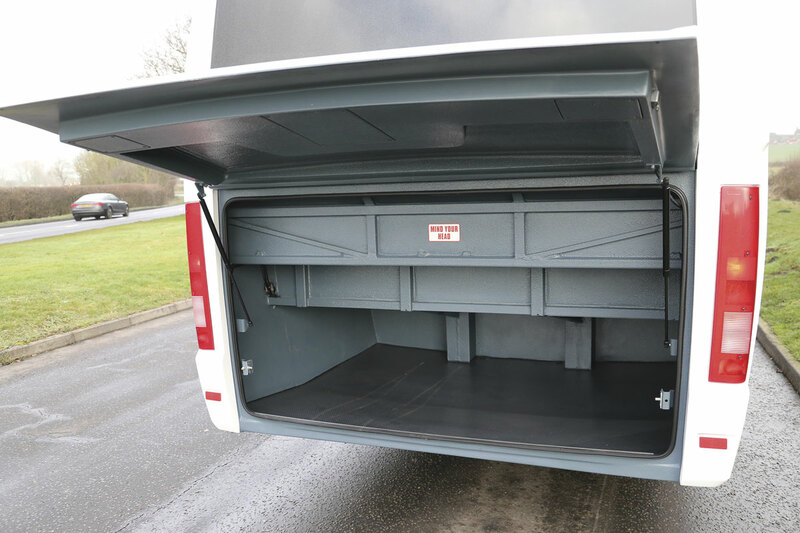 Ahead of the offside luggage lockers, there is a further locker with a sloping base and a bar across it on which the spare wheel is mounted. Mounted on the roof, above and slightly forward of the rear axle is the Carrier five-speed air conditioning system. Ahead of it is a single unglazed emergency escape hatch. Reached via three steps from the ground, the front platform and all of the saloon floor is finished in wood effect laminate. At the entrance, there is a vertical hand pole to the right that forms part of the door mechanism, while on the left a substantial chrome finish rail is provided. To the right is an Inova courier seat with folding armrests on both sides and a three point belt. It has a squab that folds flat to maximise platform space and incorporates a useful additional hand hold within its base. Beyond the platform, there is but one more aisle step within the slightly sunken gangway and this ahead of the penultimate row of seats towards the rear, with the main part of the saloon having 1,900mm of headroom. 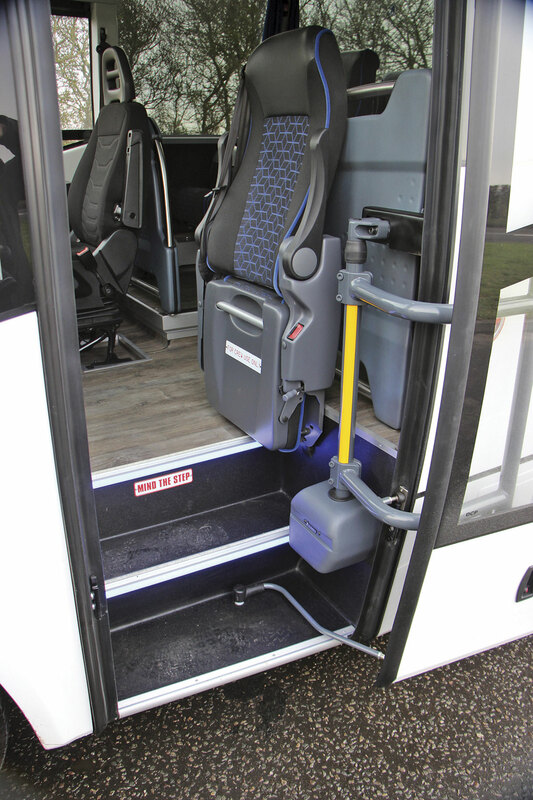 The only other variation in floor height is in the cab where the driver’s seat is mounted within a shallow well. As you look down the coach, the impression you gain is a good one. 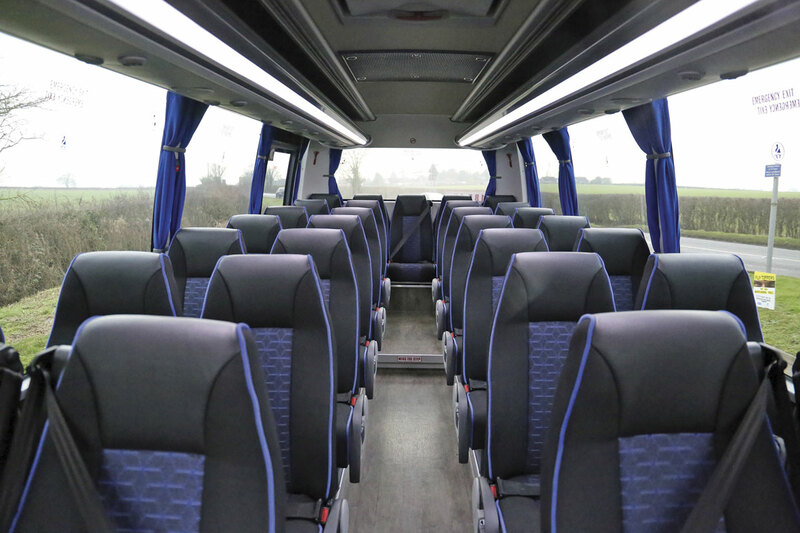 John, who specified the initial stock vehicles, explained that rather than use moquette which he feels can make a coach look re-trimmed rather than new, he opted for more automotive style fabrics from Kneitz in shades of blue and charcoal grey. This is applied with the blue pattern in the centre sections of the seat and plain panels to the sides, set off with blue velour type piping. 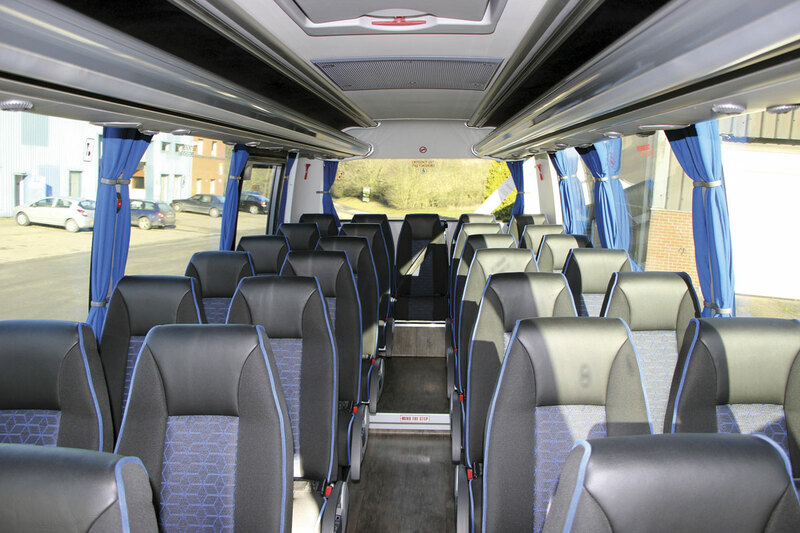 The rear of each seat is entirely upholstered in a plain grey soft trim. 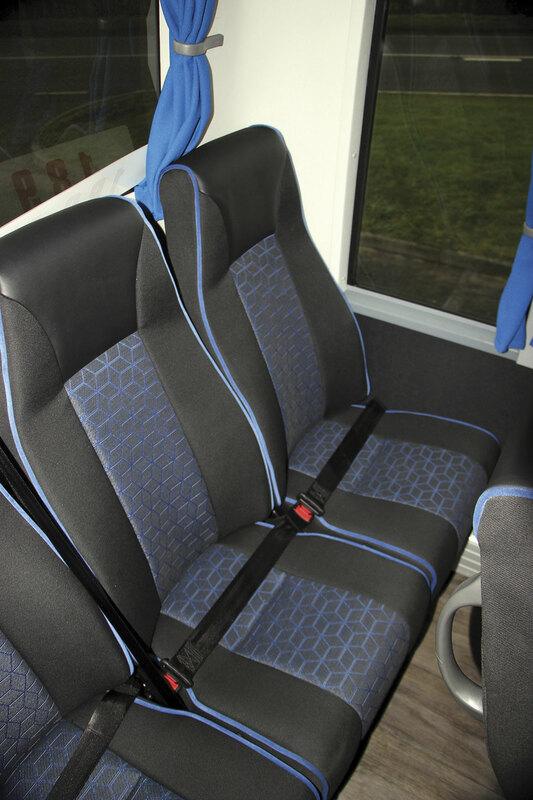 The original Iveco driver’s seat and the courier seat are trimmed to match. Ahead of the front seats on both sides are decency screens with chrome tubular rails to the top and aisle side with grey plastic moulded body sections. Body side interior panels are in grey in a fabric with quite a leathery feel. Full width curtains are also blue and will be full drop (these weren’t, they had been made a little too short by a UK supplier but they are being replaced). 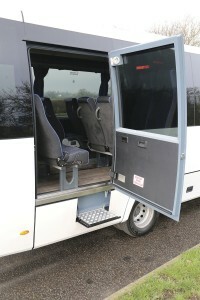 Two curtain retainers are provided on each pillar with curtains also provided for the rear windscreen. Full length racks run along each side of the saloon with air ducting built in, lighting running the length of the lower edge and passenger service units incorporating fresh air blowers, lights and loudspeakers set into the undersides at appropriate intervals. Radiators run along each bodyside at floor level. All other surface finishes are in shades of grey plastics, the ceiling having a grille for the air conditioning (chilling) system and ahead of it, the emergency hatch. Vogel’s Eco 10 is a comfortable seat. 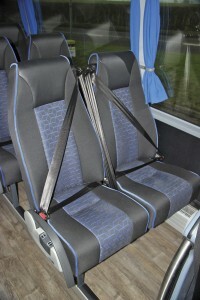 Fitted with lap-belts other than in the front two rows and the rear centre seat where three point belts are installed in accordance with the regulations, they are equipped with gangway armrests, side movement, recline, coat hooks and single grab handles to the aisle side of each individual seatback. There is no magazine net or pouch as standard, nor a footrest, but these and other options could be supplied on a bespoke built vehicle if requested. Legroom is good at each seat with a minimum pitch of 680mm. At the front, the headlining is moulded with a driver’s locker located above the driver’s head. Within the headlining is a digital clock with a red display as well as a driver’s interior rear view mirror attached to it. For the driver, there is an electric sunblind with a solid lower section that is not quite the full width of the screen area. The original Iveco dash, which is very acceptable, is retained with the addition of matching width extensions. On the offside, the extension houses a bank of body related control buttons and displays including that for the air conditioning system. Ahead of this, beneath the driver’s window, is a further array of buttons and further back is a small storage compartment for the driver with a push button released lid. The window itself is a manually operated sliding unit that opens horizontally, the front section sliding to the rear, the other section heated. A Webasto DBW2010 pre-heater forms parts of the specification. 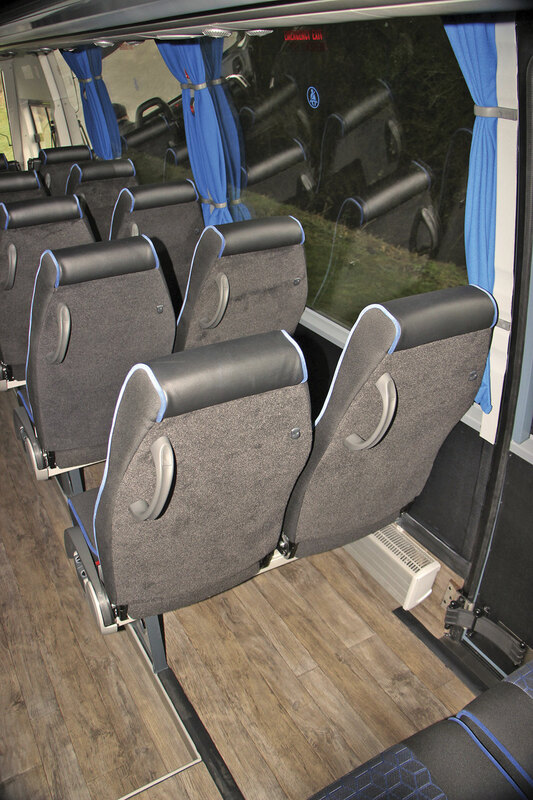 Although wood effect flooring, identical to that used in the Levante, was presented in the evaluation coach, I believe carpeting to the entrance steps, driver’s area and aisle is provided with the coach. I’ve rather lost count how many developments of the Iveco Daily there have been but the latest generation marked a significant upgrade. It was launched in 2015 as a Euro5 product and last year the Euro6 version was unveiled on top of Monte Bianco/Mont Blanc. A full report appeared in B&CB issue 1376, 29 April 2016. Both chassis cowl and stripped chassis cowl versions are available to coachbuilders and Salvador Caetano take the full chassis cowl complete with bonnet assembly, though the windscreen is a bespoke Caetano design unique to this product. Having already spent €500m developing the third generation Daily, Iveco then invested a further €100m to achieve Euro6 compliance with it. Although there are both higher and lower output versions of the F1C engine available for light duty operation, the only version certified for the heavy duty application necessary for a coachbuilt midicoach is the 170hp/125kW rating. 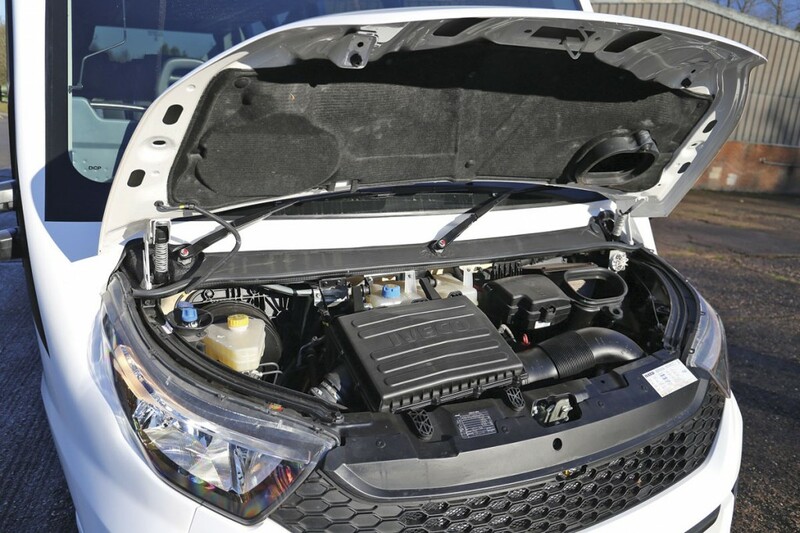 The front mounted engine is an in-line four-cylinder unit with 16-valve Unijet common rail fuel injection and a three-litre (2,998cc) capacity. 170hp/125kW is achieved at 3,500rpm and peak torque of 400Nm is delivered at 1,350-3,000rpm. A VGT turbocharger is employed and emissions control is by means of both EGR (exhaust gas recirculation) and SCR (selective catalytic reduction) with a DPF (diesel particulate filter) and DOC (diesel oxidation catalyst). One of the strong points of the latest generation, at least from a PSV operator’s standpoint, is the introduction of the Hi-Matic eight-speed automatic transmission which is fitted in conjunction with a Telma LVRS600 retarder. To say this gearbox offers car-like characteristics has to be true as I was told at the launch that it is also fitted in a number of Jeep and Maserati models amongst others. I was a little confused because Daily models fitted with Hi-Matic transmissions are supposed to have brightwork fins in the front grille to distinguish them from manuals and ours didn’t. I can’t explain why this is the case as it definitely had the eight-speed automatic unit. ECAS air suspension is fitted on the rigid twin-wheel rear axle and, at the front, there is an independently suspended system with torsion bar and power steering. Wheels are 195/75 R16 units and a spare is provided. Brakes are full disc all round. The front track is 1,725mm and that at the rear is 1,661mm. The wall to wall turning radius is 8,500mm and the kerb to kerb radius is 8,150mm. The AdBlue tank is a 25-litre one that is filled from under the bonnet and I believe the capacity of the diesel tank is 100-litres. 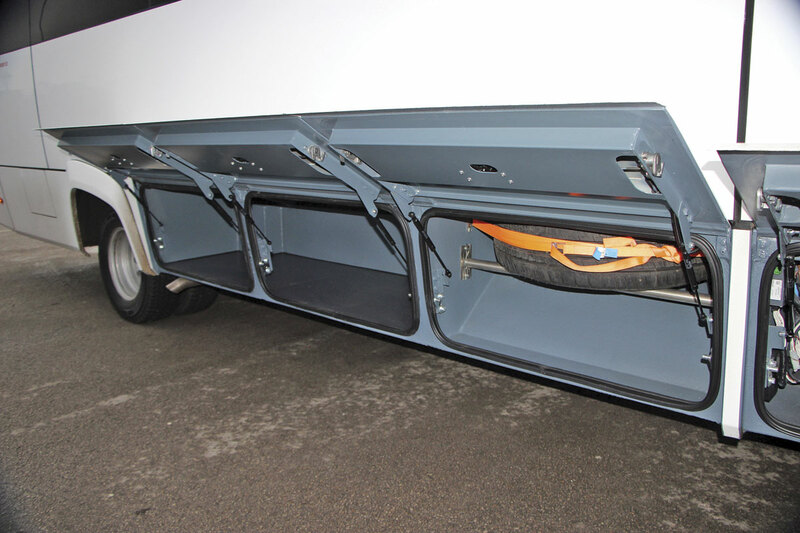 The diesel filler cap is behind a hinged flap set within the first panel beyond the passenger door. The vehicle comes with a cruise control feature and digital tachograph. 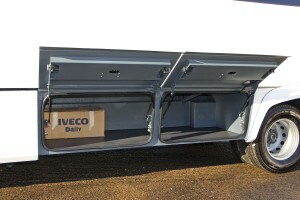 Iveco also supply a towing hook, wheel chock, reflective triangle and tool kit. I was not accompanied by one of the regular panel of B&CB evaluation drivers so it was Adrian Humphreys of Caetano who undertook the driving for a varied route that took us across country roads, motorways and both single and dual carriageway A-roads. Adrian’s first comment on the driving experience was that it was ‘nice and smooth.’ Expanding on this, he said that although the Optimo had a 4.1-litre engine, ‘this has a lot more poke.’ It is governed to 62.5mph/100kph, ‘but has a lot left’. It accelerated well, a trait that the Iveco has also been popular for. In handling terms it was good, much better than the Optimo had been. Top gear appeared flexible. At 50mph it was already in eighth recording around 1,750rpm and on the limiter at 62.5mph it was showing 2,250rpm. We did briefly have a problem with the emergency buzzer sounding to indicate that the boot lid was open (when it wasn’t), but Adrian popped round the back at our first stop and swiftly rectified the matter. One small criticism Adrian made was that the mirrors could be improved. ‘They could be bigger so that you could see more, especially on the passenger side. You can’t adjust them sufficiently to see enough of the back end, there is too much of the side, though the offside is fine,’ he said. 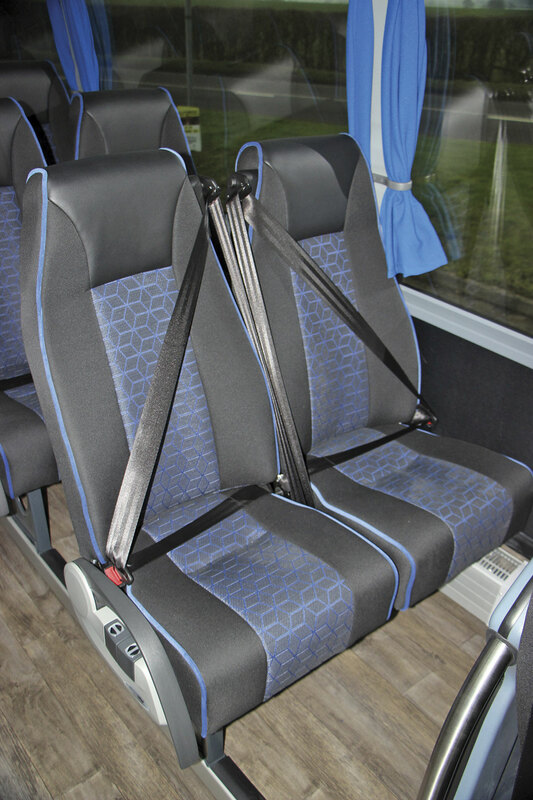 As a passenger, you do feel the road surface variations, they are transmitted through the seats and there is a little sway, but it does a fair job of ironing out the undulations and that would no doubt improve when the coach was loaded. Caetano stopped naming coaches after Portuguese places a while ago, although National Express has chosen the Boa Vista moniker for its new double decker, but the last incarnation of the Optimo (which come to think of it isn’t a place name either) was known as the CS700. 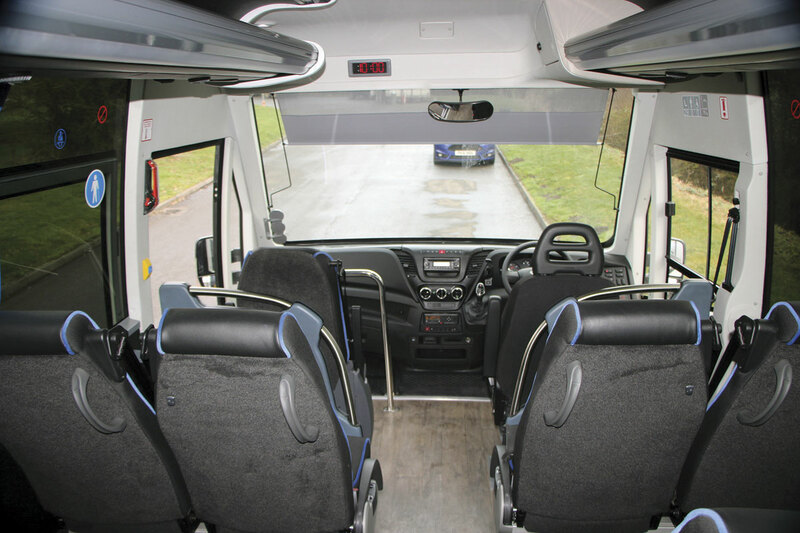 It is quite common for the rest of Europe to use the term bus to refer to a coach and no doubt it won’t raise an eyebrow in other markets but we in the UK are more pedantic on the distinction between buses and coaches and therefore I question the wisdom of including bus in the iTrabus’s name. I’m not aware of there being any particular relevance or implication attributable to the iTra bit in iTrabus either and wouldn’t be entirely surprised if a new name more pertinent and therefore appealing to the UK market was chosen at some stage. John confirmed that the iTrabus name is used and recognised throughout Europe. 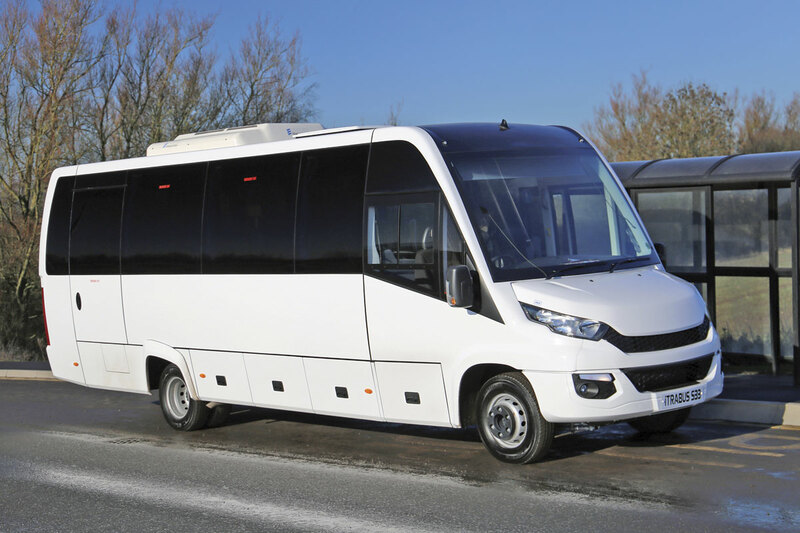 I don’t want to harp on about the demise of the Vario but this is a coach aimed squarely at the 29-seat sector of the market it occupied, and as such is quite a step away from the Optimo. It is a completely different beast to Iveco’s own factory built Tourys which seats a maximum of 19 in the UK, and smaller than the Atego based coachbuilt alternatives and the Chinese midi integrals from Yutong and King Long. With so many options from a plethora of suppliers, it is difficult to predict either the size of the market for it or what percentage of it that the iTrabus might take, but, in buying from Caetano, operators will have confidence that they know how to make a product that endures. There has inevitably been a rise in cost with the drop in the value of the pound but taking this into account, the retail price is £115,000. As the initial idea is to sell from stock, the opportunity to incorporate options is limited, but John told me that, although no such variant has been engineered yet, he believed it would be possible to build one with a rear tail-lift and double doors at the back instead of the current boot. 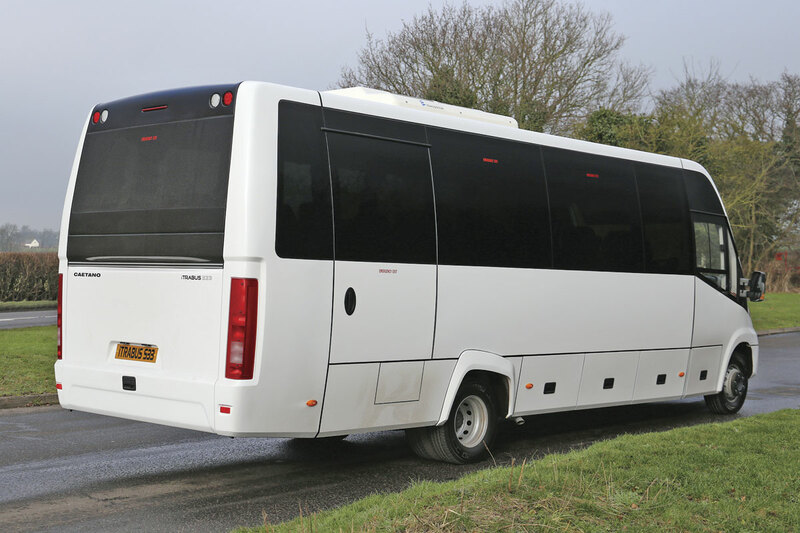 As the iTrabus is not built in the UK, it does not come under the auspices of the UK scheme, but it is covered by a similar international scheme that now includes 24 coachbuilders. 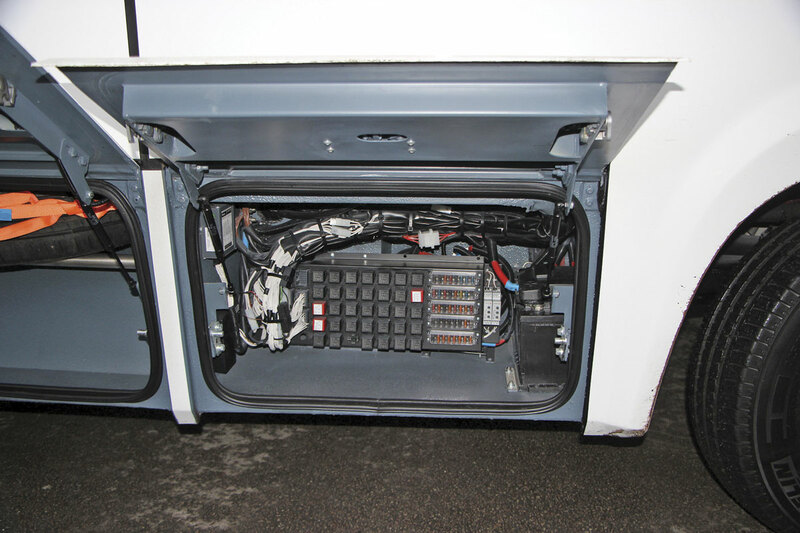 John told me that the chassis came with two years full Iveco warranty in addition to two years Caetano warranty. Is the Daily the new Vario, perhaps not yet in the affections of small coach operators but it is catching on and this new offering from Caetano is a worthy new addition to the options available on it and a great choice for those who are happy to stay with the 7.2 tonne maximum GVW and 29-seat capacity rather than going to a higher weight truck chassis, with the compromises in entry layout and noise that this often brings, or a more expensive full integral design. The Optimo had a large and enthusiastic following in its day and though there are now many more players in the coachbuilt market, this iTrabus ticks the boxes for passengers and drivers alike.